Judy Kim has been working with international students at Hope since 2007. 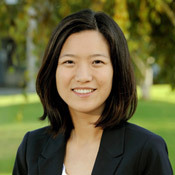 Her role as the Director of International Student Programs includes assisting international students in their cultural adjustments, overseeing international student programs and activities, advising students on immigration issues, and facilitating awareness, understanding, and appreciation for diversity in the campus community. Judy also oversees the ESL Program in the areas of admissions, placement testing, and faculty and student support. Judy holds a B.A. in Psychology from UCSD and a M.A. in Teaching English to Speakers of Other Languages from California State University, Fullerton.